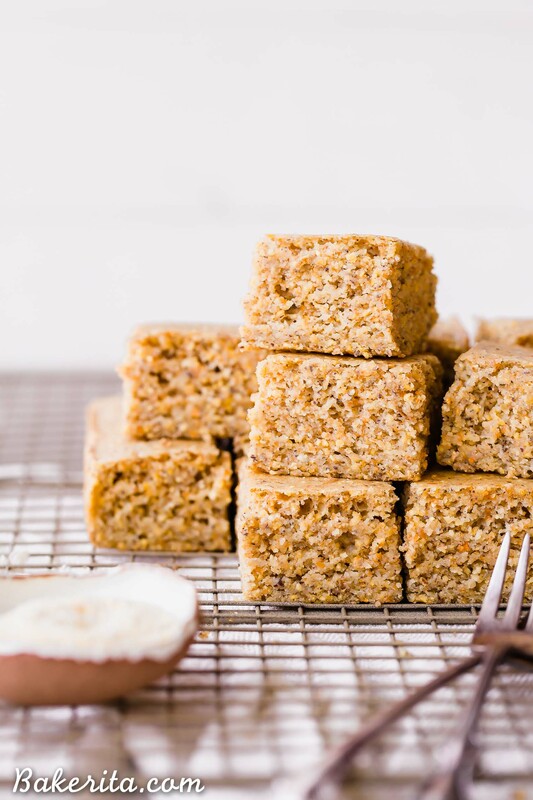 This Gluten Free + Vegan Cornbread is fluffy and light with an amazing texture from the cornmeal! It’s perfect served with soup or chili, served as a side or snack, or just topped with a little bit of butter or spread. This post is sponsored by Bob’s Red Mill. I’ve been wanting to make a gluten-free and vegan cornbread forever it seems like. The recipes haven’t ever turned out quite right – always too dense, or too cakey, or not a good enough texture or flavor. Which is why none of them have ever made it onto this site. UNTIL NOW. Because you guys, I finally nailed it. Right in time for the Superbowl too…so you can have a delicious side to your steaming bowl of chili. Which one are you making – my classic best chili? My paleo chili? Or my white bean chili?! I’ll be making the white bean chili, and it is gonna be perfection when paired with this fluffy, delicious cornbread. It’s pretty dang easy to make too. Just whisk together the dry ingredients, whisk together the wet ingredients, stir it all together, and your batter is done. Just pour it into the pan, or into a muffin tin if you’d prefer, bake, and voila – cornbread. You really don’t even have to wait for it to cool before digging in, because cornbread is always better when it’s steamy and warm. Swoooon. Just make sure you’ve got the butter (or ghee, or vegan butter ) on deck and ready to spread! 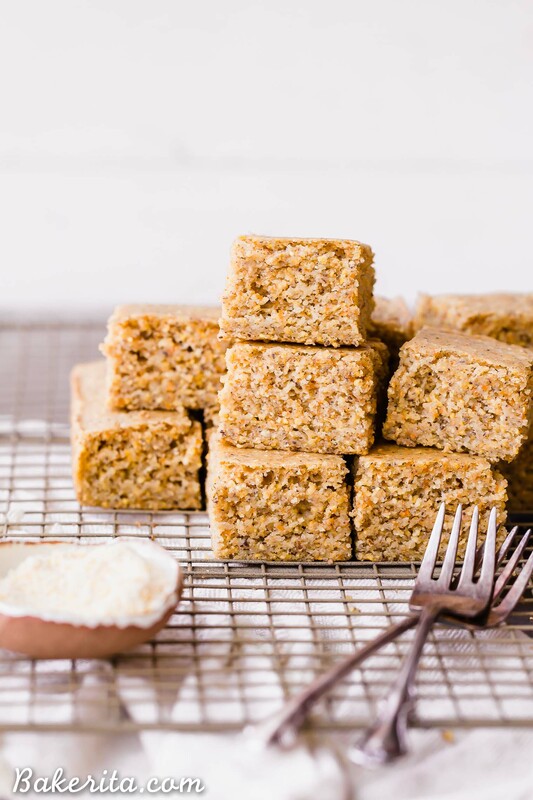 The BEST Gluten Free + Vegan Cornbread! We’ll have a quick chat about how to make the cornbread, what goes into it and why and whatnot, and then onto the recipe! Since most great cornbread starts with buttermilk, we make our OWN dairy-free buttermilk here. A cup of dairy-free milk + a tablespoon of vinegar are stirred together and left to curdle a bit. It’s also great to make your flax eggs right at the beginning, so they’ve got time to gel. THEN, mix up all those dry ingredients. 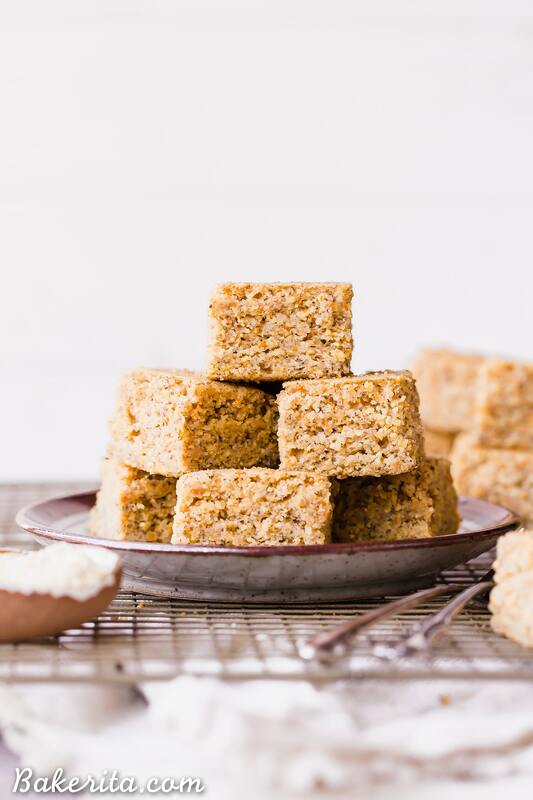 I used blanched almond flour and tapioca flour, both from Bob’s Red Mill – the blanched almond flour helps give light flavor and texture while the tapioca flour makes it super fluffy. Of course, can’t have cornbread without cornmeal. I use Bob’s Organic Medium Grind Cornmeal here too, which is the true star of the show. It adds such a nice bite with some grit in the texture and a sweet corn flavor. There’s also baking soda, baking powder, salt, and coconut sugar. For the wet ingredients, we’ve just got a touch of maple syrup to add a little extra sweetness, melted coconut oil, and the buttermilk we made earlier, along with the flax eggs. BTW – those little brown flecks you might see in the photos of the cornbread? Those are just from the flax meal. 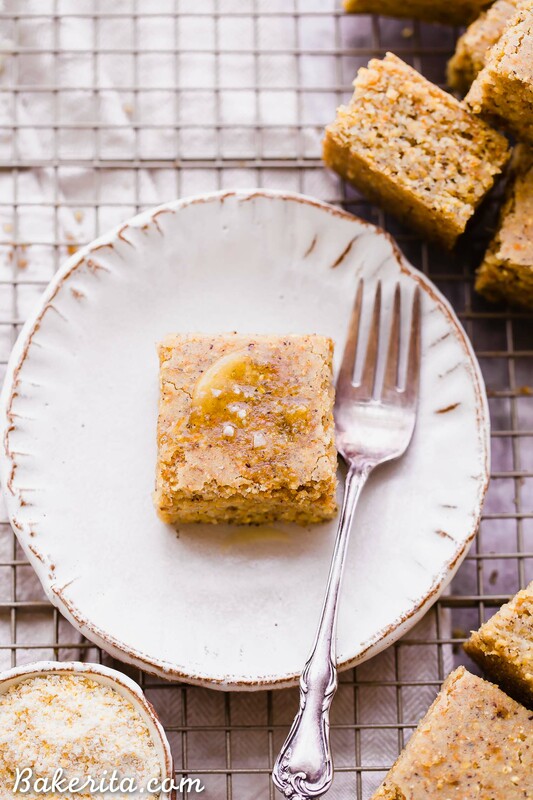 This Gluten Free + Vegan Cornbread is fluffy and light with an amazing texture from the cornmeal! It's perfect served with soup or chili, served as a side or snack, or just topped with a little bit of butter or spread. Preheat oven to 400°F. Line an 8x8” square baking pan with parchment paper and grease with coconut oil. Set aside. Combine the non-dairy milk and white vinegar in a bowl to let the milk curdle a bit into buttermilk. Also make the flax eggs at this point, to give them time to gel. Meanwhile, whisk the almond flour, tapioca flour, cornmeal, baking powder, baking soda, and salt together in a large bowl, making sure to get all the clumps out. Add the coconut sugar, melted coconut oil, and flax eggs to the milk and vinegar mixture and whisk together until smooth. Whisk the wet mixture into the dry ingredients until smooth and combined. Pour the batter into the prepared pan and smooth the top. Bake until golden brown and a toothpick inserted into the center comes out with just a few crumbs attached, about 22-24 minutes. Let cool in the pan for 15 minutes, then remove from the pan and place on a wire rack to let it finish cooling completely. You can also serve warm, if desired. In fact, I recommend trying a piece warm. Enjoy! You are basically amazing! I’ve wanted to try to figure out a good cornbread recipe, but you beat me to it! I’m going to try it very soon, because I’ve been missing cornbread. :) Thank you so much for your amazing recipes! Hi! Love your recipes :) Could you substitute the flax eggs for whole eggs? Dear Rachel! Thank you for another masterpiece recipe from you! It even exceeded my expectations, actually) Since I couldn’t find medium grind cormeal, I used polenta instead, it has more fine texture, I guess. And it turned out to be just delicious! Thank you very much once again! Hi Rachel! 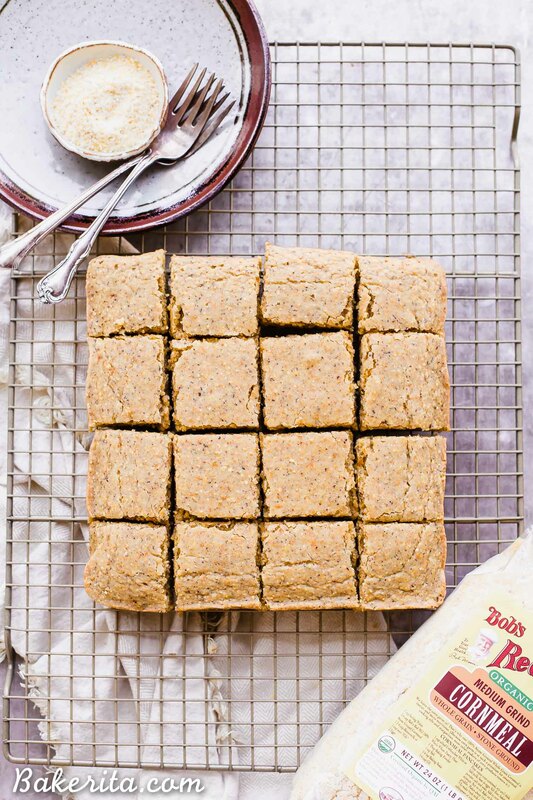 This recipe looks absolutely amazing, I’m looking for a good vegan & GF cornbread and yours really looks fab! I’d like to substitue the almond flour by another gf flour as I have allergies, any ideas or tips? I just made this to go with dinner tonight and I admit I ate one-third of the pan :) No need to say that it was quite tasty. 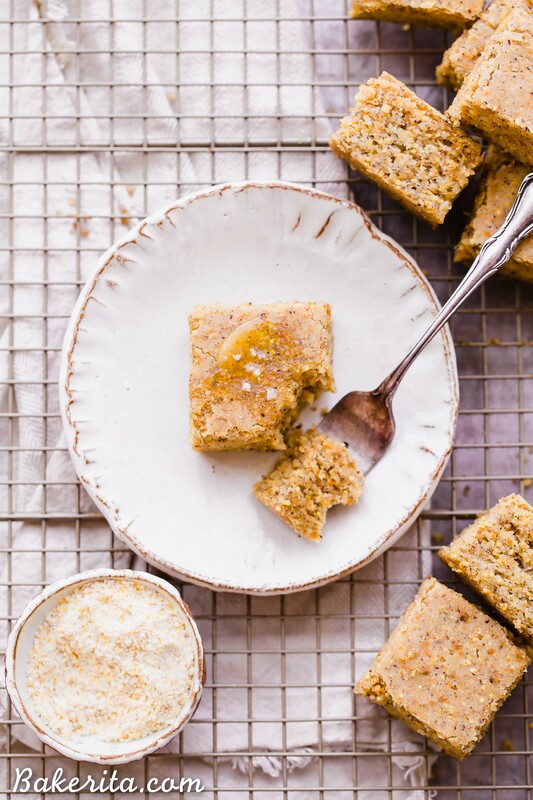 The only surprise is that it is not all that similar to traditional cornbread since it has the mix of the almond and tapioca flours. I would say it’s like a cornbread-biscuit hybrid. I had it with pork carnitas and rice but I feel like it would go even better with a veggie chili. Thanks for the recipe! Hi Mary, so glad you’re enjoying it! I don’t find it to be anything like a biscuit, but things can always bake up a little bit differently in different kitchens and I know cornbread varies region by region. Thanks for your feedback! So thrilled to hear that!! I searched forever too, and when I couldn’t find one, created my own :) so glad it satisfies your cravings too! What will happen? How can I still make it vegan? Hi Ann, I’m not sure what you mean – you only want to use a 1/4 cup almond flour? You could try substituting a different kind of flour but I’ve only tested it as written. Changing the types of flour doesn’t affect it being vegan.